I took a video last night (9/23/15) that shows lights "ghosting in" from the far left like in the original video but they seemed to be well up near the top of the mountain and maybe even coming from the other side of it. The yellow arrow shows where this light would have started with the blue arrow being the very peak of Bigelow. 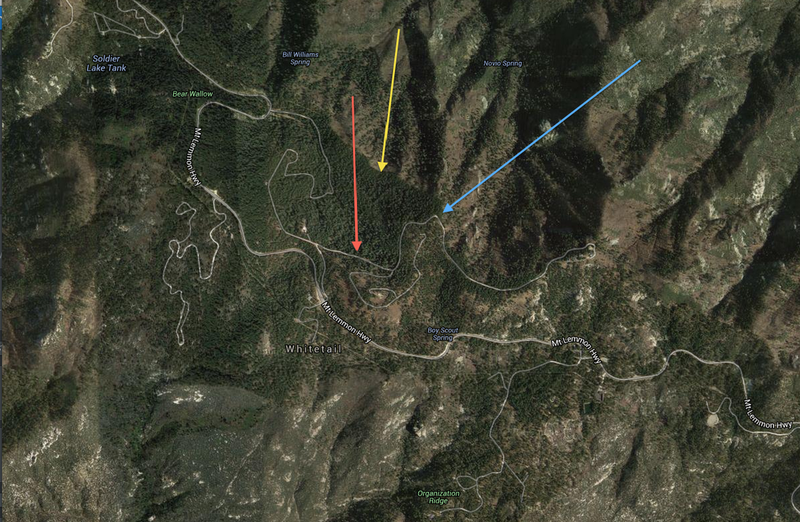 The red arrow points to a road down at the base that is completely buried in trees and goes to a lower elevation than the highway which takes that road out of the picture. These Google map images are dated as taken in 2015 so likely there are no new roads. The yellow arrow above again shows the top of Bigelow and the blue arrows show the path of the lights coming in from the left in the original video. At least this is what seems to be happening. I made the following unedited YouTube video that demonstrates that at no time can car headlights be seen on the main highway and the only lights that look like car lights in the video begin at 1 min. 15 secs. into the video. Click the button to watch the video. Above is a Goggle Earth capture from the backside of Bigelow facing Tucson to the south. The dark purple arrow on the far left is the lighted towers. The red arrow in the center is the small peak between the peak of Bigelow and the lighted towers. The yellow arrow is the peak of Bigelow. The broken blue lines to the right show what looks like the course of the "ghosting" lights. Note the sharp elevation drop off the back of Bigelow and also down the line of the blue arrows. The yellow circle is the building with the 4 unlit towers on it and the purple arrow in front of it shows the dirt road deep in the trees going up to Bigelow. The white arrow is the main highway. All of these points create quite a mystery as to where this seemingly non existent road would be. Here is the likely solution. In the photo below it shows the dirt road just below the building with the unlit towers and then the main highway below. The blue arrows show the progress of the headlights as they ghost to the right. 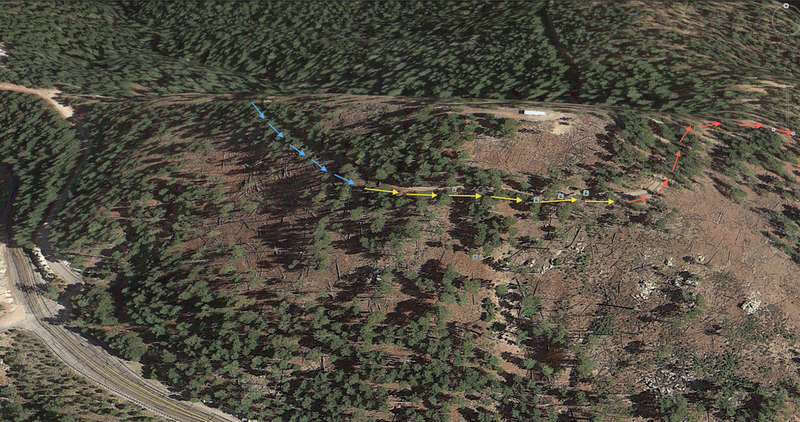 The yellow arrows show the lights as they have come into focus in a location that has sparse trees and the red arrows show where the lights begin to disappear back into the woods. These lights look like they're near the top of Bigelow but they just happen to be at about the same height as the camera caught them even though well in the foreground. There is a very good chance that these were motorcycles thus allowing them to set up easily on the narrow road and then point their headlights towards Tucson. There are photos of Tucson taken from this point on the road so it might be a local insider's popular place to go to look down the mountain. That means that people parked right on this very narrow single lane road with motorcycles and deliberately shown their headlights down to Tucson and then put on a colored light display for their friends below who were likely in cellphone contact with them. Therefore, no one was up at the building with the unlighted towers as I thought might be a solution to the mystery. It also explains why when the 2nd set of lights appeared to the left of the first in the original video it made a turn so its taillights could be seen since motorcycles could do this where cars could not. Likely they augmented their motorcycle headlight display with green and blue lasers of low power thus not wiping out the image on my night vision camera. Thus after thorough investigation including going up to this location there is only one possible place for this to have taken place and that is where the yellow arrows are above with the blue arrows showing the path of the lights in the original video and the video from last night coming in from the left. I'm not saying that this is an absolute "case closed" explanation for what was seen in the original 4th of July video but all the anomalous factors that made no sense previously become explainable with this analysis. Thus I'm going to keep this "case open" since there's always a possibility of more information making this tilt more towards a UFO as the explanation.